A pewter hip flask makes an excellent gift to a drunkard. Ooops, sorry...it makes a great gift to anyone who fancies drinking in style, anytime, anywhere. You don't need to bring bottles around, that's for sure. A hip flask is thin and is shaped to fit into your trouser pocket, so it's easy to carry around. It's quite discreet too. Historically, the hip flask evolved into it's current shape during the 18th century. Prior to that it was bigger and could be made from anything from animal bladder to gutted fruit. Nowadays they're mostly made of stainless steel. I have held both pewter and stainless steel hip flasks and found that a pewter flask of the same size is actually heavier. That was initially surprising because stainless steel has a higher density than lead-free pewter (pewter with lead can be heavier since the density of lead is very high). The difference was actually in the thickness of the flasks. With stainless steel, being of higher strength, you don't need very thick walls. Pewter is a softer alloy, so a thicker wall is neccessary to prevent the hip flask getting dented from all the knocks that it suffers at the hands of the brutal drunkards. Err, sorry...I mean the drinkers. Since there is so much wide space on the hip flask, generally most people won't pass up the chance to engrave something on it. You can engrave anything you can think of, and it would actually make the gift even more appreciated by the recipient. Many hip flasks have become sought-after collectibles. Flasks from certain liquor producers such as Jack Daniel's are popular with loyal drinkers and collectors. I saw a cool and supposedly rather old Jack Daniel's hip flask at a local market but it was too pricey for me. Regrettably, I had to pass it up. The Chinese character in the middle of the hip flask means 'prosperity'. It's in a very good condition and comes with a little white plastic funnel for pouring liquor into the flask. You can fill up to 12cl of liquor into this one. 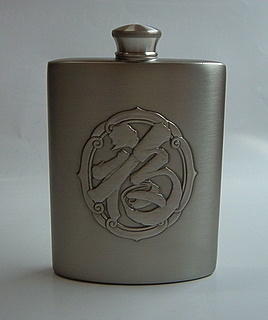 I've also been scouring for a pewter hip flask with an interesting design and found this one with a coffin shape. If you're one with a taste for the unconventional (or in this case, macabre), then this one might be for you. This little drinker's coffin comes from Sheffield, England. If you like something highly polished, then you'll like this one. It has 4oz capacity, and is about 4.4 inches tall. Imagine swigging from a coffin...interesting, huh? By the way, before you use any pewter hip flask, do try to find out if it contains lead. Modern pewter should not contain any lead but it pays to be extra careful with the older ones.